Gerard Lopez set the goal for Lotus this season to improve the championship standings from last year. It would mean at least silver in WDC and at least bronze in WCC. Kimi Räikkönen and Lotus stayed well in the schedule until summer, but now after seven races the driver is 3rd and the team 4th, in other words exactly where they ended last season. They got only three points from the last two races, points that Räikkönen scored. Romain Grosjean has now raced three races in a row without scoring any points. Hence the rumours about him being replaced by Davide Valsecchi grow stronger and stronger. Lopez followed the race with a serious face, still he wasn’t ready to throw the towel in Montreal. “Races like these don’t really help our championship battle. It’s clear that we can’t afford to have a third race like this in Silverstone,” Lopez told Turun Sanomat. “Monaco is Monaco and here we got a bad start to the weekend with the weather. We took wrong tracks, but I want the team to be back in the leading battle next race. Did James Allison’s departure affect the results? “It had no influence. He is a good man but he is not a God,” Lopez emphasized. Then what about the rumour mill around Räikkönen. 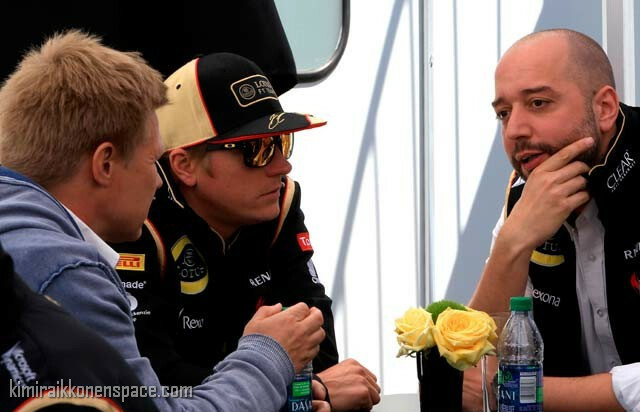 What is Kimi’s situation with Lopez and Lotus? “Everything is completely okay with Kimi,” Lopez assured. Eric Boullier walked around with a gloomy shadow, but he emphasized that there is no reason to panic. He’s not the only one frustrated, I can assure you! The slump in Lotus’ form does not come as a surprise though. Lack of funds and the departure of Allison are major contributing factors. My guess is that Lotus will bounce back, but it will be too late. Then Kimi’s departure for Red Bull Racing 2014 is all but guaranteed. I think this situation is going to play well for Kimi no matter what. If Lotus manages to fix their problems, Kimi will be fighting again for wins. If not, he will switch to Red Bull. Red Bull is not in perfect position. Maybe Vettel and their financial power won’t be enough, so Kimi can be very helpful there. Also, Kimi is scoring consistenly. Perfect for boosting their WCC chances.